For a fake sceptic who is constantly disputing numbers that have been provided by observers, checked by analysts, verified by scientists and fit with the theories - Anthony Watts is remarkably accepting of numbers that he likes, even though few if any experts in that field pay them any mind. I'm talking about Anthony's love affair with Alexa. No, it's not a woman it's a webstats service now owned by Amazon.com. More than 40% of WUWT visitors don't bother to read a full WUWT article! Today Anthony has put up another chart, this time boasting of his bounce rate (archived here). The bounce rate is the proportion of readers who visit a site without clicking through to another webpage on the same site. Let me point out that to read an entire article on WUWT requires at least one extra click. So if WUWT had a bounce rate of 40.90%, that means that 40.90% of his visitors don't even read one whole article. On the other hand, a site like this one shows the most recent seven articles that you can read in full without clicking through once. So if there was a bounce rate of 18.60% that would mean that even though readers could read seven articles in full and still be counted as a "bounce", 81.40% of visitors want more than just those seven articles. That's assuming Alexa was close to being accurate. BTW - for some weird reason, Alexa.com has always shown HotWhopper with an unbelievably low bounce rate. On Google Analytics the bounce rate is quite respectable - varying each month between 55% and the low 60%s. That number can't be compared with the Alexa bounce rate but I figure it's pretty good. Particularly when more than 3/4 of visits are from people who've visited before so they are probably just catching up with recent articles and don't need to click through. Here's a discussion of bounce rates. As an aside, when the Scottish Sceptic put up a web ranking, Anthony's second comment and his only request AFAIK, was to ask him to include yours truly or, as Anthony put it the lunatic fringe blog known as “hotwhopper". In this latest article on WUWT, HotWhopper is noticeable for its absence. Now why would that be, I wonder? Surely Anthony isn't just limiting his list to websites with a higher bounce rate than WUWT! Talk about cherry-picking! Given that Anthony seems to have left a few sites off his little list, lets add some back. Wunderground.com, with it's brilliant blogs has an Alexa rank of 606 - Anthony's blog isn't in the same league so I can understand why he left that off the list. It's got a decent bounce rate too. A bit better than WUWT at 39.4%. Thinkprogress.org, which hosts climateprogress has an Alexa rank of 4184, a lot better than WUWT so I can understand why Anthony left that off the list, too, even though it's bounce rate is higher than that shown for WUWT. Anthony has to work hard to "compete" against real climate science websites, like realclimate.org, which despite only posting a few articles a month has maintained a strong web presence for many, many years. Anthony has to put up at least three silly articles a day to attract his visitors. Quantity wins over quality every time with the illiterati. I notice that in the comments, someone unkindly drew attention to the fact that most WUWT readers, according to Alexa.com, don't rate highly education-wise. Skepticalscience.com also continues to impress and doesn't have to put up three or more shoddy articles a day to attract a lot of visitors. It has a respectable Alexa.com ranking FWIW and, though it has a higher bounce rate according to Alexa.com, it's articles are based on science (unlike WUWT) with hyperlinks to lots more information. I've written before about how people who want to read about climate science have a zillion more choices than science deniers who want to read about pseudo-science. So the number of hits on any pseudo-science or anti-science blog like WUWT would be barely a blip when compared to all the hits on science and climate science websites. One good way to improve your Alexa ranking, if it's important to you, is to write a blog article called "How to improve your Alexa ranking" - and/or get readers to install the Alexa toolbar, spyware and all, and then plead with them to visit your blog! It's not as if Anthony needs to do this sort of thing to fake a jump in his readership. His blog is very popular and gets lots of hits every day. As he later found, his blog is right up there in popularity among wordpress blogs. It's not just the 8% dismissives who go there, even normal people visit WUWT to see what the wacky deniers and climate conspiracy theorists and other utter nutters are up to. Update: Last year, Victor Venema did an analysis showing that the uptick in WUWT's readership in May last year wasn't real. It only showed up in Alexa, not any other webstat measure, and can therefore be attributed to Anthony's toolbar request. Alexa isn't reliable for web stats. What it does is measure the traffic of people who have the Alexa toolbar installed. This is what Paul Stamatiou, designer at Twitter, wrote about Alexa rankings back in 2007, showing the big difference in Alexa rankings between two sites that had similar numbers of visitors. John mentioned in a recent post that he received 266,641 page views from 127,614 unique visitors during the month of February. For February, I received 227,852 page views from 136,064 unique visitors. Does the Alexa graph below show that? Besides the obvious issue that your rankings will be based only on those who actively participate with Alexa, there is also the issue that your competitors (or you) can easily purchase hits for Alexa for just a few dollars. I saw an ad on Fiverr offering to let people buy hits in packages of about 10,000 or so for Alexa to build rankings. No – I wouldn’t say Alexa is useless. It’s just not a very accurate measure of your site’s popularity amongst the Internet elite of the world. It is helpful to put up a high Alexa ranking because of the herd mentality issue – people like to visit sites they think are popular. So when you have a high Alexa ranking, they think your site is worth something. After Collin's article and my mysterious drop in Alexa rankings even though Google Analytics showed HotWhopper was getting more readers by the week, I did a little experiment - I soon varied it from the experiment I wrote about here. I installed the Alexa toolbar on a browser that I don't normally use and made sure I visited HotWhopper every day and opened a few pages. Alexa.com dropped my ranking while Google showed no particular change. The Alexa ranking then dropped hugely for no reason around the end of January, while Google Analytics was showing a big jump in visitors from December. It was at this point that I installed the Alexa toolbar and opened a few HotWhopper pages every day. You can see the results above. The Alexa ranking for HotWhopper immediately stopped falling and started to improve again, quite markedly. I don't know if Anthony Watts is looking to sell his website or get more advertising revenue or if he is just looking for pats on the back. Whatever, he's deluding himself if he's relying on Alexa rankings to compare his website with other climate websites. It would be interesting if he used another comparison, like comparing how climate scientists rate his website alongside that of, say, realclimate.org or skepticalscience.com. I have a feeling it would look something like this. Sou, Willard sends his winged monkeys over here from time to time, many of whom have followed their masters bidding and installed the Alexa bar. Perhaps some of the unexplained changes in traffic as "measured" by Alexa are a result of WUWTians dropping by to have a spit about your latest takedown - February had a few threads that attracted a lot of replies, including a lot of anonymous trash, presumably from Anthony's footsloggers. 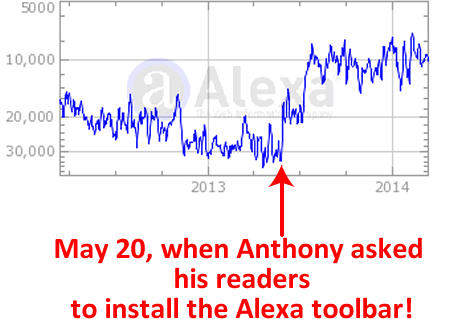 I do think it more likely that WUWT readers have the Alexa toolbar installed than HW regulars. I looked to see if there was a rise in Alexa rankings when Anthony first advertised HotWhopper, but I couldn't see it. Also, not many people come here directly from WUWT. About the most WUWT visitors at a time was about 40 hits when HW was referred to in one of Anthony's blog articles. I've concluded that WUWT-ers don't follow links as a rule, which is borne out by the comments over there. The other explanation is that WUWT doesn't get anything like the visitors the stats make out. I don't quite buy that one, though if you were to go by hits from mentions - climateprogress is about four times more popular than WUWT. Neither of the two explanations would be anything for Anthony to boast about. Technically a bounce is a visitor to a website opening one page and then leaving. As soon as there is some form of page reload event and the user then leaves it's not counted as a bounce. From the bounce rate alone you cannot see what visitors are doing, you need other measurements for that. It's just a measure of how successful you are in getting visitors to read more pages on your website. And yes, I work in IT. I'm a software engineer by education and work as a support engineer at a Dutch firm. Which means I maintain services/servers, solve bugs, provide training to customers, and create new features, to name just a few things that I do. Thanks, Collin. I think I've interpreted "bounce" correctly in my article or are you pointing to a mistake I've made? "Let me point out that to read an entire article on WUWT requires at least one extra click. So if WUWT had a bounce rate of 40.90%, that means that 40.90% of his visitors don't even read one whole article. " Bounce rate doesn't tell you how long someone was on a page or how much of the page was read. You are only taking into consideration people arriving on the front page of WUWT. Not for example on the blog posts themselves or any other pages. So you cannot use the bounce rate to conclude anything definite about how much/what is being read. It will influence bounce rate, but how it's being influence you only can tell from how visitors are navigating your website (see "Behavior Flow" in your Google Analytics for an illustration of that). I'm assuming that most people first arrive on the home page. I will make that more explicit. If most people first arrive on the home page and 60% of them leave without clicking, they they cannot have read an entire article. That's because the home page doesn't have any entire articles. You need to click through to read a whole article. In other words, I did make the assumption that to get to an article a person would first land on the home page. It's quite probable that some people get there via, say, a link from twitter, or a link to a particular article from another source like Google. And you're right, there's no way of my knowing how they land at WUWT or what proportion land first on the home page rather than on a particular article. Dr. Joe Romm did a pretty good takedown of Anthony's comments regarding website hits, probably 3 or so years ago. I think it was regarding Alexa as well, but not sure. He basically showed that Anthony doesn't understand how the internet works, doesn't understand what the terms he uses actually measure, and doesn't understand how the internet works in general (none of which are a surprise). This might be the Joe Romm article Hit charade: WUWT hypes itself with dubious webstats, while lowballing other blogs from 27 Mar 2010.
" I notice that in the comments, someone unkindly drew attention to the fact that most WUWT readers, according to Alexa.com, don't rate highly education-wise." Anthony Watts attended Purdue Uni for several years. He didn't graduate but he must have passed the first few semesters of study.